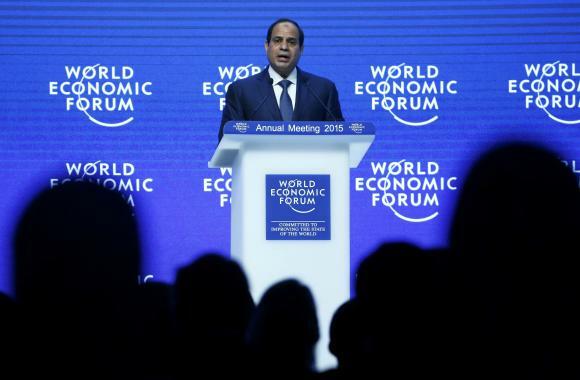 Egypt’s President Abdel Fattah Al-Sisi has once again addressed the international community, presenting Egypt as a counterweight to extremism at the World Economic Forum in Davos, Switzerland. “You speak to us not only as the President of the country, but someone who has significant influence on the future,” said the speaker who introduced President Sisi to the stage, adding that Egypt plays a pivotal role in the Middle East. Taking to the podium, Egypt’s Sisi tackled the issue of extremism and Islam’s portrayal as a religion that harbours radical views. “No one can monopolize the truth. No one should believe their ideas are better than others,” said the Egyptian President. “Islam is a religion with values of tolerance embraced by more than a billion followers. It should not be evaluated by the actions of murderers. We must mobilize all our efforts to eliminate the scourge of terrorism,” added President Sisi. “We, as Muslims, must seek reform and re-evaluate our perspectives so we do not allow a minority to distort our history,” said the President weeks after he urged Al-Azhar, the top Sunni Islamic institution, to lead efforts for a ‘religious revolution’ that tackles extremism and radicalism. The President also drew comparisons between the latest Paris Unity March, France’s largest ever march, which saw millions pour onto the streets of France to condemn terrorism following the killing of 17 people at Charlie Hebdo and a Jewish supermarket. The Egyptian President, whose speech can be watched in full below, also addressed the Israeli-Palestinian conflict and the global economy. “If we are able to reach peace between Israel and Palestine we will create a new reality in the region,” said the President, saying the resolution of the conflict is central to peace in the region. On Egypt, Egypt’s President admitted there are many challenges and promised the youth must play a central role in the future of the country.